Use a fairly aggressive push to get the brace down into the toe box. If the brace slides into the shoe easily, the shoe may be too large. Find the smallest shoe that can hold the brace. 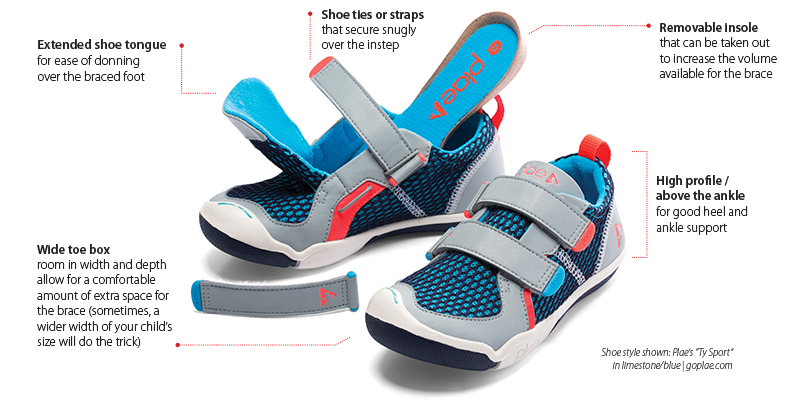 You may have to wiggle and push the brace into the shoe before the heel drops in. This extra work means the shoe will be only slightly longer than normal. If the shoe is too long, your child may trip over the toes. A shoe horn helps get the braced foot into the shoe. You may want to shop without your child. Take the brace with you and try fitting it into the shoe. You can often buy shoes, take them home for a relaxed fitting session and return or exchange them if needed. Once you find a brand you like, go to that specific brand again for a dependable fit. Consider slightly altering the shoe, especially in canvas shoes with a sewn, overlapped toe box. 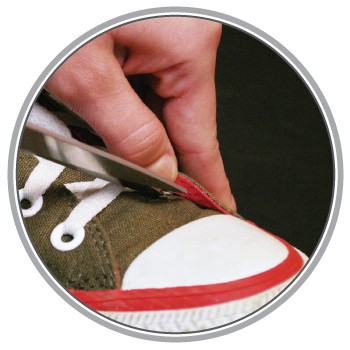 Try snipping a few threads that hold the toe box closed around the attached end of the tongue. Look at the shoe as you insert the brace and foot to see where the material stretches as it holds the brace. A minor cut at this point can provide more room. The brace will slightly increase the length (height) of the leg it's on. To maintain even leg height, put a molded insole into the unbraced foot's shoe. Our HotDog and PattiBob shoe inserts are ideal for this. For a bulkier brace, you may need two differently-sized shoes -- one for the unbraced foot and a larger size for the braced foot. For more room, consider altering the braced foot's toe box (as shown above in the fitting tips). Stores that offer a wide shoe selection are often functionally appropriate, stylish, and considerably less expensive.